Occasionally I go on the geek version of a bender, where I try to find a new something--in this case, a new media player (and next, new backup software). I've tried dozens. I've discarded dozens. I've returned to only a few, and never been completely satisfied. Now, I may be. First, I really don't like Windows Media Player. For one thing, it doesn't remember settings, such as how I've sorted lists in the media library. If I open the Songs folder, and click on the Album heading so that I can view songs by album instead of artist--just like I would do with a CD collection--then close/reopen WMP, the setting is lost. Microsoft, on their site, says this is to improve performance. WMP also does weird things with MP3 tags, especially in how it tags artists. Finally, I didn't find a mini player that I liked, and this was part of my obsession. I like the iTunes interface and easy filtering/searching of tracks. I don't like their mini player. They have no skinning. And--forgive me--I don't like Apple. Their products are fine, but Apple is far more proprietary than Microsoft. With that said, I used iTunes the most over the last few years. Songbird caught my eye awhile back. It's an iTunes look-alike. It has a great miniplayer, looks good in default mode, and can be modified to show the "genres" pane that appears in the iTunes interface, thanks to it being open source. Unfortunately, it's still in pre-release and lacks stability and performance. Keep an eye on it. So, finally, I reinstalled WinAmp. I've tried WinAmp a few times in the past, but never quite liked it. And, I've become used to the iTunes interface. When I play music, I normally choose a genre and shuffle, or shuffle everything. Many players don't make this easy (surprisingly). WinAmp now includes a SmartView playlist that has similar filter panes to iTunes. The default Local Media view doesn't show these filters, but I just added a SmartView for all tracks and the Genre/Album filter, which meets my needs. Next up was a miniplayer. This may seem like an odd requirement, but I like my player to be visible, yet out of the way. At the same time, it needs to provide playback controls, easy access to the media library, and track display. And it needs to be readable. I looked at hundreds of WinAmp skins, and almost no one makes a skin that is long and slim (sometimes called a "shade"). I was about to give up. And then, duh, I checked the default skin's shade mode. At first, I was disappointed, since it didn't show track info. Until...I increased its size. I could also apply a nice theme color, City Night. Finally, I could override the default font and use Verdana, which looks very good on LCD screens with ClearType enabled1. The only thing I can't do from the miniplayer is turn shuffle on/off, but I can live with that, as I can get to shuffle via right-click. 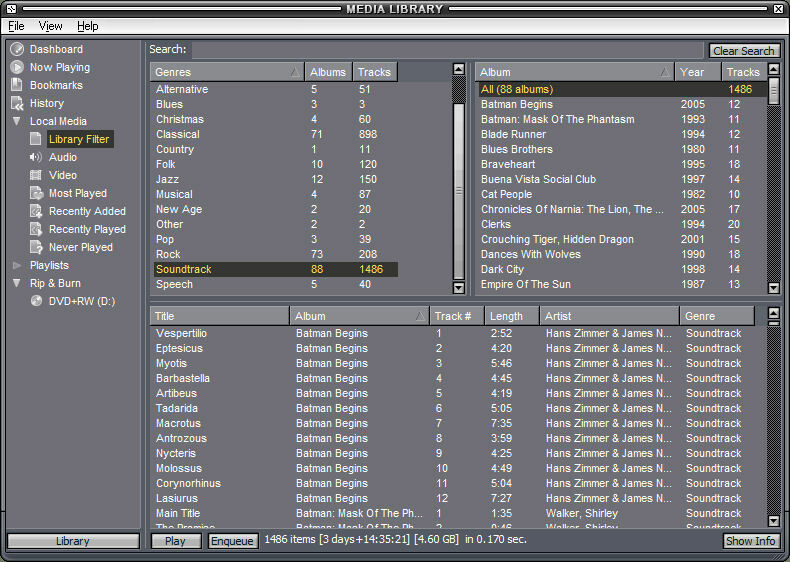 WinAmp has a new "Modern" skin engine with slick features. I can recommend WinAmp so far. 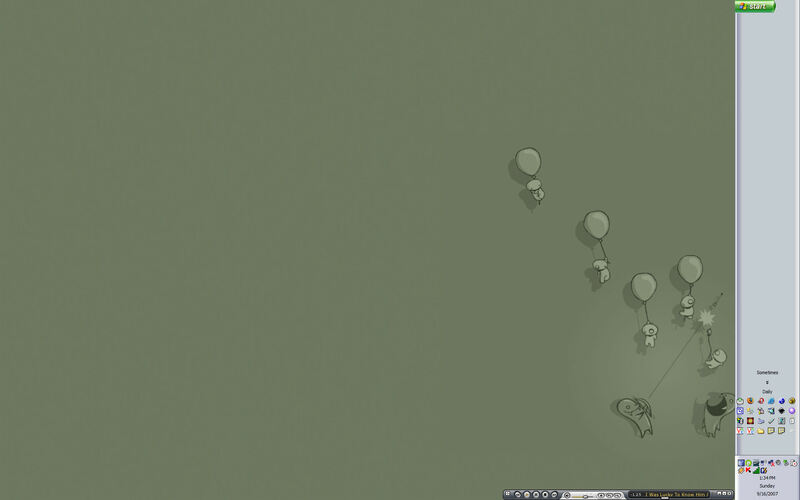 Here's a shot of my desktop, with WinAmp miniplayer at the bottom. The desktop is running the Silver version of the standard XP theme. The task bar is on the side because I often have many windows open and can more easily read the window names (thank you Albert!). I use customized toolbar folders to hold my most used shortcuts. And I like wallpaper that doesn't distract me (too much). My Dell Inspiron 8600 runs a resolution of 1920x1200, which is, yes, a little hard on the eyes sometimes. And, a shot of the media library with my SmartView. 1Microsoft has a nice tool called ClearType Tuner for adjusting ClearType settings to make the text as readable as it can be.